One of the south-east’s most experienced and respected property sales experts has joined Leaders to oversee its sales operations. Adam Howell, who has spent more than 14 years working in the industry, recently started at the estate agents as its new Area Sales Manager for Surrey and Kent. He has been tasked with growing the company’s sales services across the region, which have expanded significantly in recent years. Adam says: “After working for several well established estate agents, I was attracted to Leaders by the opportunity to be involved in something that is growing at a rapid rate and has huge potential over the coming years. Adam lives in Kent and has immense knowledge of the region, as well as experience of selling properties in key commuter areas, having also worked for a major estate agents in Essex. 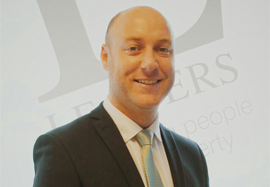 Kevin Shaw, national sales director at Leaders, says: “I am delighted to welcome Adam to Leaders and look forward to working with him as we aim to further develop our local teams in Surrey and Kent and continue to deliver industry-leading customer service. Leaders continues to expand and now boasts more than 120 branches across the country. If you are interested in starting or continuing a career in the fast-paced and unpredictable property industry, find out how the company can help you realise your ambitions at leaders.co.uk/pages/career-profiles.